You have two options when it comes to a PCS military move. You can either let movers pack and move you to your next location or you can "Do It Yourself" or DITY. A DITY move is a move you accomplish yourself, also known as a PPM or Personally Procured Move. Instead of allowing the government to handle getting your things packed and moved to your new duty station, you take full responsibility yourself. It most definitely requires more work to move yourself than to let paid movers do it for you! However, DITY moves are all my husband and I have chosen to do for each of our PCS moves and here’s why. While we all like to believe that people coming to move our belongings are kind, trustworthy and gentle, this is not the case. By no means am I saying that if you let movers move you that you're guaranteed to have something broken or stolen. What I am saying is that it happens. There are dishonest people in the world and unfortunately, that is just the way it is. My brother-in-law had hundreds of dollars in DVDs stolen several years back, an Air Force member lost all the family's birth certificates, marriage license, social security cards, passport, and other personal items when his family moved a couple of years ago, and friends of mine had furniture broken or scuffed during their most recent PCS. While it's very possible that you may break or scuff your belongings since you are not a professional mover, you only have yourself to blame. You learn and you move on, rather than holding a grudge against your movers. Because you're the only one handling your household goods, you're in control of when they arrive at your new home. Most likely, you'll be driving them yourself, which means they will be with you wherever you are. You have probably heard of or even experienced yourself the frustration of not having your belongings show up on time. It's not unheard of to wait weeks after a stateside move for your things to arrive. You don't have to take days off work for when the movers are available to come pack you up, which also means that you are not at the mercy of their schedule if theirs changes for some reason. When you DITY, you can take as much or as little time as you want to get all your things in order. My husband and I usually give ourselves a week or so to pack up decor, dishes, and non-essentials before we bring the truck home to load. Nothing reminds you of how much you own than packing it and unpacking it repeatedly. Our constant awareness of what we own keeps me from hoarding and filling every corner of our home. Instead, we become aware of what we aren’t using, which things collect dust, and ultimately what we can say goodbye to. As we prepare for bringing our first baby home soon and a move shortly after, my husband is listing a large group of items on Craigslist and Ebay that we know we don't want to continue moving and may not have time to sell after the baby arrives. This lifestyle paired with DITY moves has made us more frugal, because we really think about an item's necessity before we ever purchase anything. One nice thing about a DITY move that's not always guaranteed is the opportunity to pocket a little extra cash. When you DITY, the government looks at the weight you moved, the distance you moved, and the time it took you to move. After reviewing this information, they reimburse the amount they would pay a moving company to do the same work. (We’ll cover this more in-depth in a minute.) Often you can move yourself for less than what a moving company would charge, which means that the remainder is strictly profit. As you can imagine, there is a great deal of work involved with a DITY move. While there are clear advantages to moving yourself, there are also reasons why it may not be best for you that need to be considered. Apart from the paperwork you keep with you, moving yourself for an overseas move is not practical. Instead, arrange a time for the movers to come back up your first and second shipments and let them handle everything. Since you'll have to wait longer than normal for your things to arrive at your new home, you'll want to really plan which things go on each shipment. I don’t mean little time to move, because my husband and I have had about a week’s notice for each of our moves and been just fine with a DITY. However, I was not working full time, so I had the time to pack our decor, wrap our furniture, and throw everything in boxes while my husband was working and completing paperwork. If you find that packing up your stuff is more work than it's worth, then a DITY move may not be right for you. The stress and effort put towards doing the work ourselves has always been worth the financial pay-off in the end for our family, but that is something you'll need to decide. If you decide that a DITY move is the right choice for you and your family, here's what you need to know. You'll be responsible for all moving expenses up front. This includes the cost of your rental moving truck, moving supplies, gas, weight tickets, and tolls for said vehicle. At the end of your trip, you'll submit receipts for each expense you made in regards to moving for reimbursement. 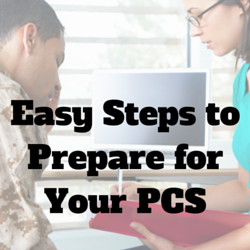 Some of your expenses will overlap with a typical PCS. For example, you will still receive per diem for hotel costs, food, and gas for your personal vehicles. You also receive a Dislocation Allowance (DLA) and Temporary Lodging Expense (TLE). There is some paperwork that accompanies a DITY move. Once you arrive at your new duty station, you must submit your claim with the transportation office within 45 days of completing your move. Your claim should include DD Form 2278, DD Form 1351-2, certified weight tickets (empty and full), PCS orders, receipts for rental equipment, fuel, tolls, and fees for weight tickets. Reimbursement for personal travel (food and lodging), pay, and allowances is completely separate from the claim for a DITY move. You'll receive reimbursement through the incentive the military provides to you for moving yourself. This encompasses the cost of the rental moving truck, moving supplies, weight tickets, and other "moving yourself" related items. Don’t let a DITY PCS move overwhelm you. Decide what is best for your family and embrace it! If you choose to complete a DITY move, use the resources the military provides. Remember, there are many other families around you that choose to relocate this way. My husband and I are right there with you! Happy moving and best of luck!